Paris High School offers a unique assortment of courses designed to enrich the student's high school experience. Also, several clusters of courses are designed to help prepare the student for rewarding work-related careers. Click on the following links to find the career cluster that is right for you! CTE: Learning that works for America from AdvanceCTE on Vimeo. GREAT THINGS ARE HAPPENING AT PHS IN CTE! 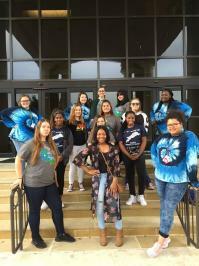 Mrs. Steele's Education & Training students were invited to Region 8 to help provide some of the instruction for a TAFE workshop. The students were able to help lead and share in breakout sessions regarding their experiences and what to expect at competition later this year. What an awesome way to represent TAFE,CTE, PHS and PISD! 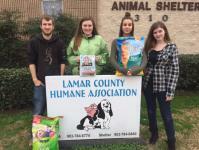 Paris FFA delivered pet food collected during the pet food drive this past November to the Humane Association/Paris Animal Shelter. FFA kids are GREAT, paring their love of animals with helping meet the needs of a great organization!